Two trays measuring 7.3" x 12"
And two trays measuring 5.6" x 12"
Download the complete brochure: click here! 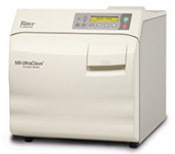 The Ritter M9 Ultraclave is one of the most popular sterilizers on the market, particularly in medical and dental offices. It’s the one with the door that opens automatically! Today more than ever, you need products that are simple to use. And the Ritter M9 couldn’t be easier, because it lets you load it... set it... and forget it. Select your cycle and the time is set for you. Press ‘Start’ and the M9 fills with the correct amount of water. Once the process is complete, the door opens automatically to dissipate steam and give you the fastest drying time possible for your instruments. It’s a real convenience and time saver… just ask the person who uses the sterilizer most in your office. The M9’s many built-in safety features such as overheat protection, a pressure relief valve and flashing ‘Error’ light increase reliability and give you peace of mind. How does the M9 compare to the Tuttnauer EZ9? 1.) Ritters have an automatic door that pops open at the end of the cycle, letting the steam out, whereas the Tuttnauer automatics (albeit a little louder than the M9) can run a closed-door drying cycle for you. 2.) Ritters are definitely more attractive and take up less counter space. 3.) Ritters come with a 12-month warranty, whereas Tuttnauers are covered for 24 months, although the Midmark-Ritter service nationwide truly sets the standard in the industry. Call now: 800-839-0722 ... or submit the short form at the top of the page for a quick quotation by email.